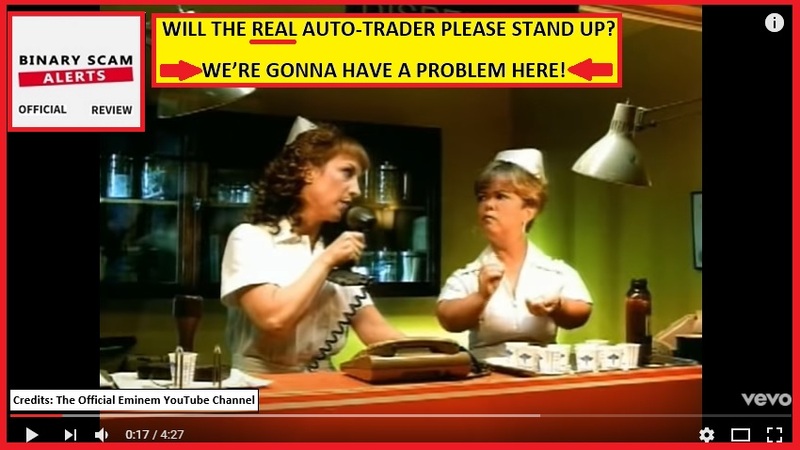 Binary Scam Alerts » Binary Options Robots » Will the REAL Binary Options Robot Please Stand Up! If you are an opportunity seeker constantly searching the internet for a genuine trading app or binary options robot that can actually make you money on auto-pilot, you should take a minute and read this insightful article. I have started this voyage of exposing binary options scams about 8 months ago after losing $500 through some fake software which promised me consistent returns on my investment and an easy way to make an extra buck online. The money I lost wasn’t much and it didn’t devastate me or my family since I had the common sense to take a step back and reevaluate my position. It did however sting and got me thinking real hard about how things work and why people buy into these bogus apps. Then it eventually hit me, human nature is predictable in most cases and savvy online marketers understand this and know how to present things in a way which distorts reality and in the process make a ton of money on the back end. With the advent of binary options trading this financial niche has grown exponentially from relatively small to a little monster, with global net-trading stats reaching hundreds of millions each month. Granted, it’s still not the size of Forex which has been around longer and has acquired a more “legitimate” reputation for some reason, but if it keeps going at the current pace it will more than make up the difference in the next year or so. How Does This Reality Effect You? In what’s becoming an increasingly saturated market troubled with regulatory constraints, credit card processing companies that charge an arm and a leg, and brokers looking to bite-off a larger chunk of earnings, the online marketers will continue to serve as a conduit connecting potential customers (that’s you) to vendors (AKA brokers). As the competition grows so does demand, and today brokers are willing to pay very hefty commissions for paying customers wanting to trade. This means the marketers are getting aggressive, which is fine if you are sending a promotional email or presenting an ad. The problem starts when key bloggers, content networks, and mainstream media outlets cover systems in a way which motivates opportunity seekers such as you to invest in a seemingly legit trading robot. The profits are high and temptation is always there, but the really honest review sites will only feature a few select systems which have been examined and tested to provide optimal results. At times, these results are initial so the reviews are positive but as time passes the loss ratio increases due to a variety of reasons I can’t cover now and what started out as a legit software has turned into an investment scam. How Can You Spot a Fake Review Site? Well, that’s relatively easy. Try comparing the review site to a brick-and-mortar store offering you a variety of products to choose from. Some are good and some are bad, but you can see exactly what you are buying and what you pay for. The same criteria applies here, so if you have a website that publishes mostly good reviews you can pretty much be sure he is not looking after your best interest. Secondly, there are various marketers out there that understand how to manipulate the google search algorithm and achieve good results. These are also relatively easy to spot since they have spelling errors and their writing style is not natural or intuitive as the image below depicts. Additionally these fake review sites copy certain segments from high quality review sites that offer original and innovative content in order to mask their actions. The strange characters indicate there is something mechanized behind the content, because no human being will ever publish a review in this way. The grammar and spelling errors indicate a lack of professionalism or high probability that the content is rehashed or spun through some automated content software. So, this is the real question – what to believe! The answer is fairly simple once you think about it. In this business most systems will be a little dirty at best. That is very logical because people will always complain and gripe since systems are hyped, massively promoted, and don’t meet their expectations. So, its OK if something has a few bad reviews, that should not deter anyone. Naturally if there are a ton of bad reviews then you should avoid it, but this also works the other way around. It’s not natural when ALL the reviews are positive, and usually this will indicate that there is a lot of hype behind a certain trading bot. If this is the case you should also back off, because you are looking for diversity of opinion which is very natural. Why Are Certain Scams More Effective Than Others? Well, take fore example the Quantum Code or Mobile Binary Code. These are very high-end productions designed to create an atmosphere of wealth and prosperity which is at your reach. People are very much influenced by these sales videos and in a moment of weakness will be tempted to try it out since it provides them with hope, even if inside they know its fake and not real they will still take a risk because “some chance is better than no chance at all”. This is they heart of the deception and why it is abhorring. These scams target the weaker segments of the population and provide them with false hopes. By the time customers realize they have been duped it’s too late and the money is gone. The SCAMS will go on, new traders will end up losing their money, and binary options robots will continue to make money for the people pulling the strings behind them. If you are looking for remedy or closure you will not find it here, I do however recommend becoming a part of our Facebook Group since this will give you unique access to consultations with other traders and direct access to myself and the Binary Scam Alerts Staff where we actually provide real and detailed information about things that actually work and make money for you.